Allows officer to keep weapon out while deciding what level of force is necessary. Allows greater ability for even the smallest/weakest officer to maintain control of their duty weapon. Allow time for officer to decide if Deadly Force is Needed. Officer can use offence, not just defense to protect their weapon. 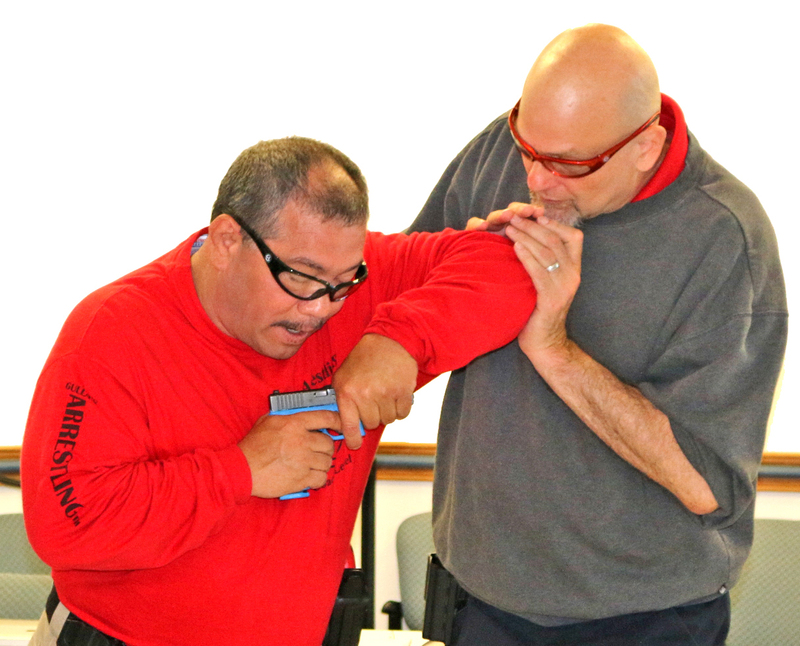 Position helps protect officer against punches and disabling head strikes. If suspect attempts to disarm officer, officer is in a position to shoot suspect. Officer can strike suspect and still place weapon on effective target areas. Officer can cycle another round, should firing again become necessary. Suspect approaches the officer yelling that he is going to take the officer’s gun and kill him/her. Suspect is clearly unarmed and continues to move towards the officer. How many would holster or leave holstered their weapon? Why ? Now the suspect starts to fight you and grabs your holstered weapon, what do you do now? Most would holster because they feel it’s safer in the holster, until it is too late. In-holster weapon retention is mostly defensive in nature. Once the officer becomes fatigued, the scale tips in favor of the suspect. 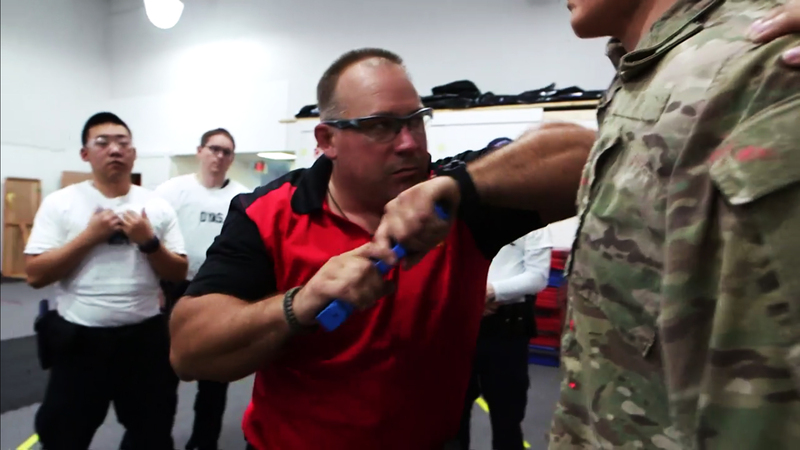 Police recruits are taught to distance themselves from an attacker. It is almost impossible to move backwards or sideways faster than someone can move forward. If the suspect is grappling with the officer, distance is no longer an option. Under the circumstances, retaining the weapon in the holster seems to be the only option left. Consider arresting a DV suspect in a living room? The greatest distance you could hope for might be a brief six feet, allowing a suspect to close the distance quickly. Multi-tasking in a life or death situation is normally not an option. 2000-2004 – 6% of officers killed, were killed with their own guns. Of that 6%, most were disarmed when their weapons were out of the holster. 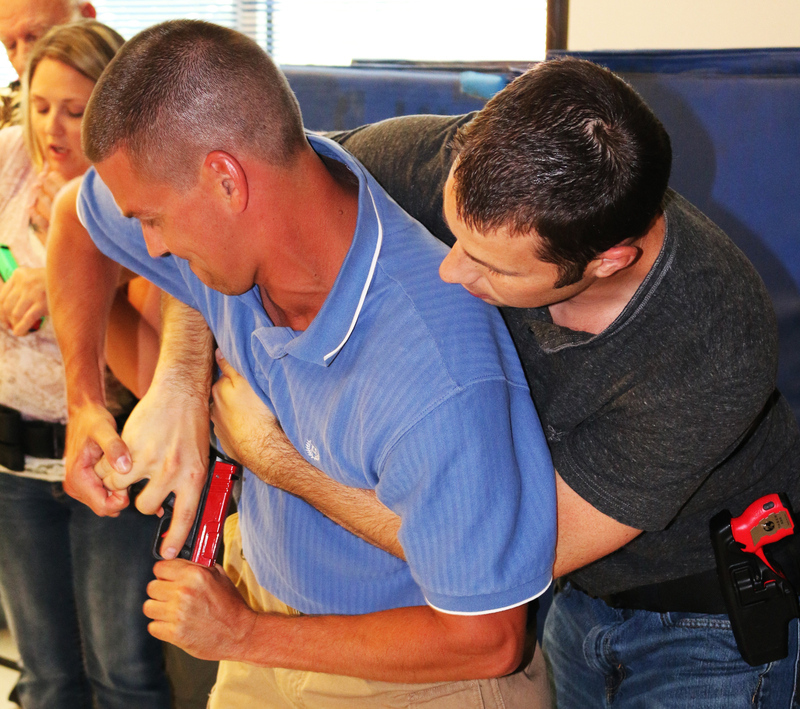 Gulla’s Weapon Retention and Positional Shooting has been taught to 1000’s of Law Enforcement Professionals. Here’s a few: Vancouver Police, Washington State Patrol, King County Sheriff’s Office, Seattle Police Dept, U.S. Border Patrol, Dept of Homeland Security, U.S. Customs, Dept of Defense, Federal Way Pd, Spokane Pd, Yakima Police, Boise Police, Meridian Pd, Portland Pd, Richland Pd, Hanford DOE, Bangor Naval Base, Federal Reserve Police, Bellevue Pd and many more.